Sophomore forward Claudia Kepler fields a puck Nov. 11 during a game against Mercyhurst at the OSU Ice Rink. OSU lost, 3-0. A three-goal second period doomed the Ohio State women’s hockey team on Saturday against No. 8 Minnesota-Duluth ahead of a 13-day break. The Bulldogs’ performance helped them to a 4-1 win over the Buckeyes, although Friday’s game was much closer, ending in an overtime tie. OSU senior forward Kayla Sullivan said that on Friday the team played like they needed to in order to get the result it wanted. 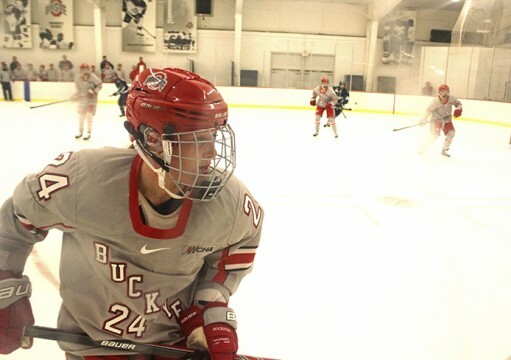 After a scoreless first period in Saturday’s game, Buckeye freshman forward Lauren Spring scored a power play goal at 2:32 in the second to take the lead. That was the Buckeyes’ first and only goal of the night. The Bulldogs’ first goal came from their leading goalscorer, Zoe Hickel. The goal against the OSU was the senior forward’s 12th goal of the season. Over six minutes later Minnesota-Duluth scored a short-handed goal to take the lead. Sullivan said the short-handed goal was the lowest point in the game for the Buckeyes. Four minutes later the Bulldogs scored their third unanswered goal, and late in the third period they scored another goal to secure the victory. Senior defenseman and captain Sara Schmitt wasn’t happy with the way her team played on Saturday. She said that it wasn’t Buckeye hockey. “The lowest point for us on Saturday was the second period, definitely our worst period. 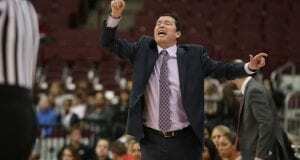 I think we had chances in the third to tie it and we couldn’t,” Schmitt said. 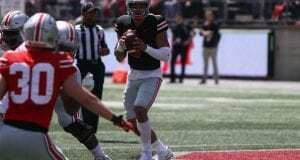 But on Friday, Schmitt said the Buckeyes played a full 60-minute game. The Buckeyes skated to a 2-2 overtime tie, while the Bulldogs won the shootout 1-0. “We played our game,” Schmitt said. OSU scored its first goal of the game in the second period. Senior forward Danielle Gagne netted her fifth goal of the season and put the Buckeyes in the lead. Senior forward Taylor Kuehl scored on a power play to put OSU back on top 2-1 after the visitors had tied the game. Then the Bulldogs were able to find the back of the net at 15:58 in the third period to tie the game. Even though both Schmitt and Sullivan weren’t thrilled with their team’s overall performance over the weekend, Sullivan said that the team learned a lot about itself in the process. In the past three seasons the Buckeyes have faced the Bulldogs in the first round of WCHA playoffs. Sullivan said her team will be better prepared the next time they face off against Minnesota-Duluth. 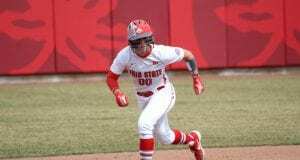 OSU has a week off before packing up for a road series against Bemidji State. The Buckeyes are scheduled to play the Beavers on Dec. 19 at 8:07 p.m. and Dec. 20 at 3:07 p.m.